FRANKFURT -- Volkswagen is still not prepared to give up on Suzuki after several months of squabbling have brought its partnership with the Japanese carmaker to the brink of collapse, a German magazine reported. "We are prepared to reach out to Suzuki. Returning our 20 percent stake is out of the question for VW," Automobil Produktion reported on Thursday, citing Hans Demant, who is in charge of the alliance at Volkswagen. Suzuki and its biggest shareholder VW have been squabbling for months, and the Japanese carmaker has asked VW for a divorce. Last week, it served VW with a notice of breach of contract, demanding the German company give it access to key technologies within weeks. Unless it does so, Suzuki's biggest shareholder must sell back its stake and quit the alliance, it said on Friday. 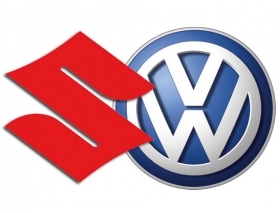 "Suzuki and Volkswagen have complementary technological approaches. But there is still industrial logic" to the partnership, Demant told the magazine. Volkswagen said on Friday it might take legal action against Suzuki after the Japanese automaker served it with the notice of breach of contract, adding that it was ''keeping all options open" with regards to the partnership. The two automakers have been arguing since VW said in its March annual report that it could "significantly influence financial and operating policy decisions" at Suzuki, describing the Japanese company as an "associate." Last month, Suzuki chairman and CEO Osamu Suzuki offered to buy the shares VW holds, and in return, promised to offload its 1.5 percent stake, worth $1 billion, in Volkswagen, back to its estranged German partner. Presented as a partnership of equals, the tie-up was meant to bolster VW's presence in India for small cars and give Suzuki access to technology it could not afford to develop on its own but the partnership has so far failed to deliver any meaningful cooperation.